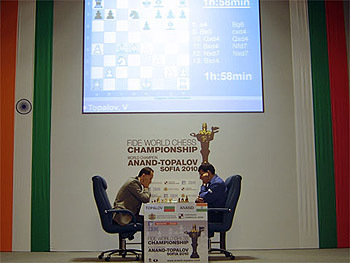 Topalov and Anand square in a pivotal 5th game. Game #5 was a key affair for Challenger Veselin Topalov. Many pundits were wondering how he would react to the severe thrashing he took in the previous game. Would he come out with guns blazing trying to get the point back? Would he try for an incremental improvement on Game #3? Would he change course and play 1.e4? All good questions. It turns out that Topalov repeated Game #3 but it would be Viswanathan Anand who tried to improve his play. In a psychological battle, Anand played the Slav, but his team may have feared that Team Topalov would find an improvement. Thus, Anand played 15…h5 instead of 15…h6 to prevent 16. Ke2 Bd6 17. h5 Bh7 18. a5 as in the previous game. This was probably too passive for Anand’s liking so he choose a more active route. Around this point of the game, the Bulgarian organizers experienced a snafu when the lights in the military club went out for 15 minutes. Both players continued to study the position until the arbiters approached the stage. This was an embarassing situation for the organizers who were already under heavy criticism for how they handled Anand’s delay to Sofia due to the Icelandic volcano. A letter of apology was released. ‘Powergate’ was a new term given to the match. The power outage lasted 15 minutes. Photo by ChessBase. Black was never in serious danger, but white had a very slight edge until the the momentum picked up. After Anand’s provocative 29…g5!? 30.Ke3 g4 it was unclear whether the h5 weakness would become a glaring problem. Topalov’s 36.e5!? was another pivotal point, but it appears that Anand had some chances after Rd7 37. exf6+ Kxf6 38. Ke2 Nc6 39. Ke1 Nd4 40.Bd1 a5!